Highlands Country Club is the oldest of the four clubs and the club where legendary golfer Bobby Jones came to sharpen his game on the Donald Ross-designed 18-hole championship course as early as 1928. It’s location within the Highlands city limits is less than one from Main Street. It has come a long way since those early years and now boasts an elegant main clubhouse that is the home of the well-stocked pro shop and locker rooms, plus a casual 19th Hole grill with veranda seating, heated pool, 2 Har-Tru tennis courts, fitness center, driving range, and roving security. Named for the river that meanders through the golf course, Cullasaja is the Cherokee word for “sweet water”. Indeed, the setting here is straight out of a fairy tale, particularly in the Fall as densely wooded areas become a canvas of orange, red and gold. However, it’s the golf course that brings people to Cullasaja, and the designer’s signature is one of the best: Arnold Palmer. Palmer’s objective was achieved in a course that is not only visually appealing and memorable, but highly playable with generous sized fairways, and difficult, but not impossible greens. 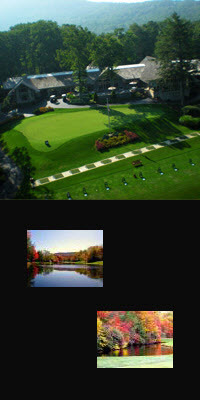 There is also a 26-acre lake, which comes into play on the 184 yard 14th hole. But the splash of golf balls isn’t the only activity on the lake. You can play 18 in the morning, then paddle out on Lake Ravenel in a canoe in the afternoon to do some fishing. At the hub of member activity is the clubhouse, a striking 14,000 square foot facility that overlooks the ninth green. 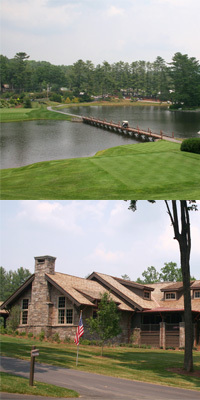 The clubhouse is home to the pro shop, dining room, grill, and men’s and ladies’ locker rooms. The adjacent swim and tennis center offers a brand new fitness facility; heated, Olympic style swimming pool; kiddy pool; and lighted tennis courts. An active homeowner’s association provides year round manned gatehouse security plus an aggressive architectural control committee. Although, primarily a single family community, there are also Lake Villas fronting Lake Ravenel where you can fish from your deck, Fairway Cottages along the 10th hole and Overlook Villas that afford stunning views of Whiteside Mountain and the forested valley that seemingly goes on forever. Imagine a course nestled among rolling hills, sheer cliffs, and mist-veiled mountains. Now imagine never having to make a tee time. George W. Cobb, world renowned golf course architect, designed the 18-hole course to championship specifications surrounded by 350 acres of wild flowers, mountain laurel, clear lakes and the soft music of crystal streams. Wildcat is one of the highest golf courses east of the Rockies and enjoys spectacular scenery on every hole with a “no tee time” policy. The course, with superbly maintained bent grass greens, tees and fairways, is not only stunning to see but highly challenging to play. Only 300 members can call this paradise their summer home. A friendly, gracious, close-knit group who enjoy the pleasure of good company and leisure living at its best. 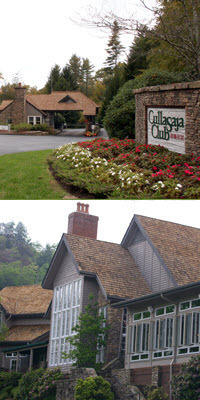 Resting atop a wooded knoll at 4,200 feet in elevation, the original clubhouse was designed in the motif of a mountain lodge with the stonework quarried and laid by the Cherokee Indians. With expansive walls of glass and breathtaking mountain scenery, there is not a bad seat in the house to enjoy the culinary delights at lunch or dinner. A Tennis and Fitness Facility includes meticulously maintained Har-Tru courts, an award-winning fitness center with indoor pool and an adjacent park with picnic shelters, trout filled pond and walking paths.